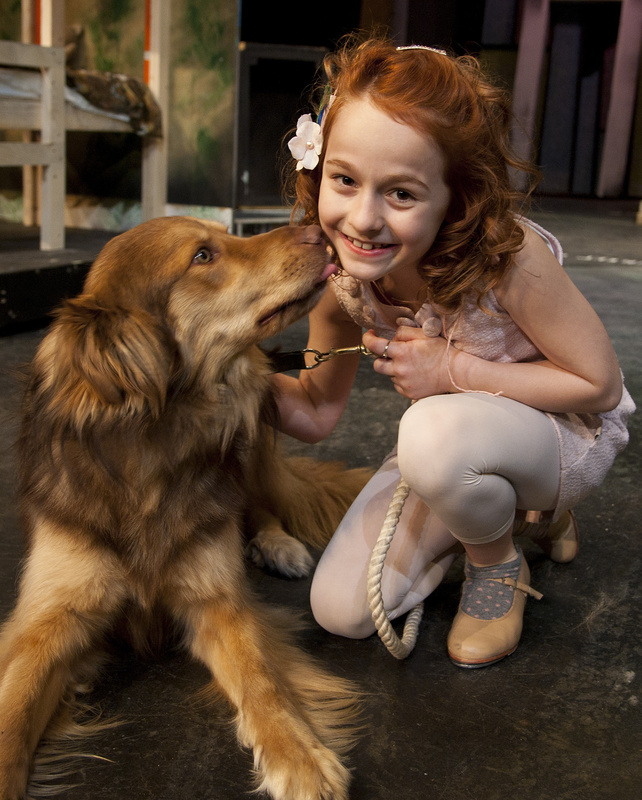 There are two stars in the Spokane Civic Theatre’s upcoming production of “Annie.” Both are cute, both have adorable curls, both are talented vocalizers – but only one was rescued from a shelter. That would be Sandy, the shelter dog playing the role of Li’l Orphan Annie’s lovable mutt. No one really knows the dog’s original name – he was brought to SpokAnimal as a stray – so trainer and rescuer Val Hughes decided to name the dog Sandy, the same as his stage name. “It just seemed less confusing that way,” said Hughes. We’ll tell you more below about the other remarkable star, Sophia Caruso, 10, who plays Annie. But first we need to explain that Sandy won’t be going back to the shelter. Sandy will be going to someone’s home – maybe yours. Hughes is a longtime Spokane dog-trainer, a veteran of supplying dogs for stage and screen roles. In the past, she has supplied her own well-trained dogs. This time, though, she came up with an inspired idea. She told director Yvonne A.K. Johnson that she would find a rescue dog, train it for the role, and then, at the end of the run, give it away to a good home, maybe to a family that had fallen in love with the dog on stage. Johnson loved the idea. However, Hughes immediately ran into challenges. She trolled the shelter websites looking for possibilities, but she knew she needed not just any dog. She needed one that had stage presence. “We needed a big, fluffy guy,” she said. She finally found her big fluffy guy’s picture on SpokAnimal’s adoption website. “Just like I met my guy on Match.com, I found my dog on Petfinder.com,” said Hughes, who added that she really did find her (human) guy online. She went to SpokAnimal and met Sandy, who turned out to be a friendly, adorable and highly energetic neutered male. In fact, someone had previously adopted Sandy, but returned him to the shelter after a couple of days, saying he was too energetic. Hughes thinks he’s some kind of shepherd/golden retriever mix and is just past puppyhood. She has been training him for a few months – but not nearly as long as one of her usual stage dogs – and he likes to yowl along with the songs. And he still retains plenty of his natural rambunctiousness. That can be an issue when Sandy outweighs Annie by about 20 pounds. Which brings us to Sophia Caruso. Spokane audiences might remember her as the diminutive bundle of energy who played Helen Keller in Interplayers Professional Resident Theatre’s “The Miracle Worker,” directed by Patty Duke, last season. This year, Caruso has been in the running for two “Annie” productions – the Civic one, and the biggest one of all, the upcoming Broadway revival. Sophia and her mom, Deena Caruso, went to New York City and stood in line with thousands of other girls at the auditions (her picture appeared in the New York Times). Sophia made it past numerous callbacks and very nearly to the plum title role. “Out of 5,000 girls, I made it into the top three,” said Sophia. The producers ended up choosing a girl with previous Broadway experience. Yet there’s still a chance that Sophia could jump from the Civic to Broadway over the next year or two. She is high on a list of possible replacements – and replacements are common in a show where little girls routinely outgrow their roles. Right now, she is giddy over just getting to play the role she has always dreamed of. Her mom bought her the DVD of the movie when she was little. She remembered looking at the cover and saying, “It looks boring.” And then she watched it. Sophia first auditioned to play Annie when she was 4. She didn’t get it. Yet that just motivated her. Now that she finally landed the role, she’s finding that it’s both more fun and more challenging than she dreamed. More challenging, because Annie has to carry the show with her singing, dancing and comic acting. More fun, for the exact same reasons. “I love a great challenge,” Sophia said. She is also finding it fulfilling in a deeper way. Sophia already has her next role lined up – Tina Denmark, the ruthless 8-year-old child star of “Ruthless!,” which will be Interplayers’ summer musical. “I have to play that role because it’s so me,” Sophia said. Finally, we must mention one potential glitch in Hughes’ plan to give Sandy away at the close of the show. Hughes has fallen in love with Sandy. She may want to keep him. “I retain the right of first refusal,” Hughes said. A special benefit performance of “Annie,” to benefit SpokAnimal, will take place May 30, doors open at 6:45 p.m., show starts at 7:30 p.m. Festival seating is $30, assigned seating is $40. There will be a silent auction with all proceeds benefiting homeless animals. Contact Gail Mackie for tickets at (509) 534-8133, ext. 202, or email gmackie@spokanimal.org. Jim Kershner is a longtime Spokane arts reporter. He can be reached at jimkershner@comcast.net.